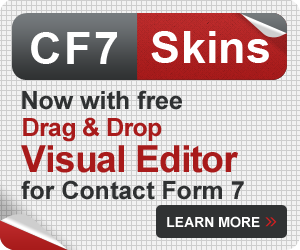 CF7 Skins Ready provides a range of useful, pre-defined styles (like evenly spaced columns & several fields on a single line) that can be used for all CF7 Skins forms. You can use the Ready classes right away without having to write any of your own CSS. 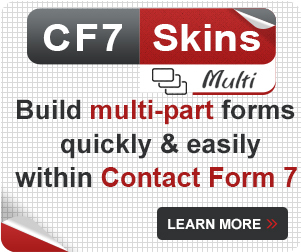 In this article, we explain step-by-step how to build a form using the CF7 Skins Ready class box. 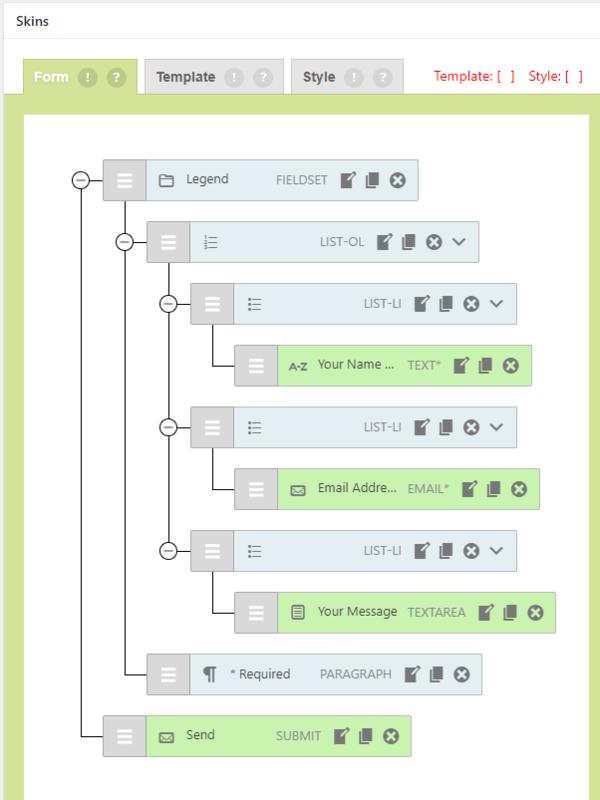 You can add a box to a group of form elements by simply adding the box Ready Class to a surrounding parent element. In this example, we are looking to add the box CF7 Skins Ready class to a LIST-OL element enclosing a group of LIST-LI elements. When we begin, we see that we already have an initial template ready for us to use. 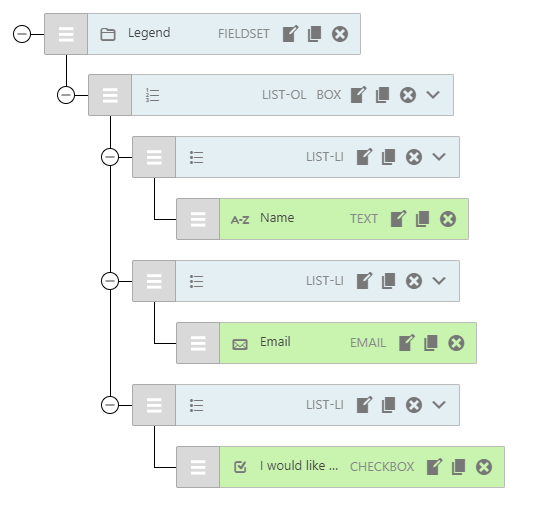 While we could use this template when building our forms, for this example form, we will delete most of the existing elements to get to a more general starting point. Click on the dropdown menu to the right of the LIST-OL element. 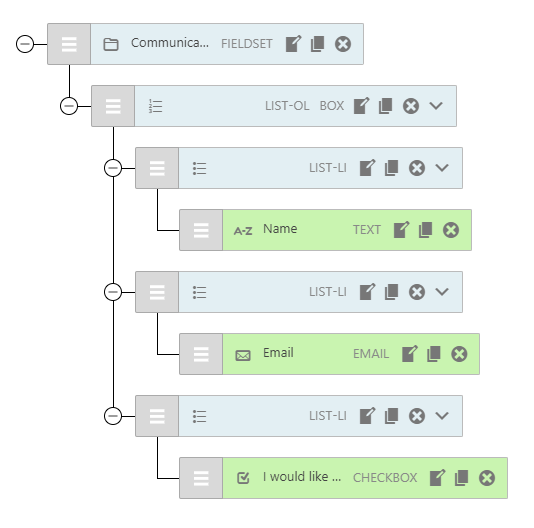 Click Ready Class to see a list of options. 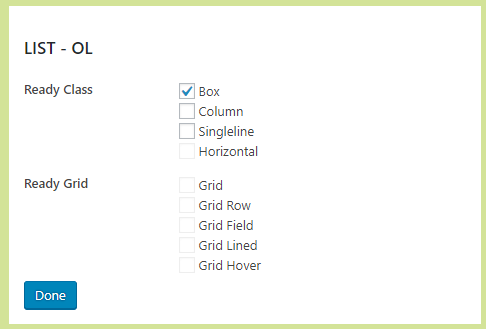 From the available list, choose box (your desired Ready class). Tip: Ready classes which are not permitted on a particular element are automatically disabled. Click the edit icon on the LIST-OL element. Then, check the Ready class you want from the dialog box that appears in the sidebar. Wherever you work, changes will appear instantly in both locations. 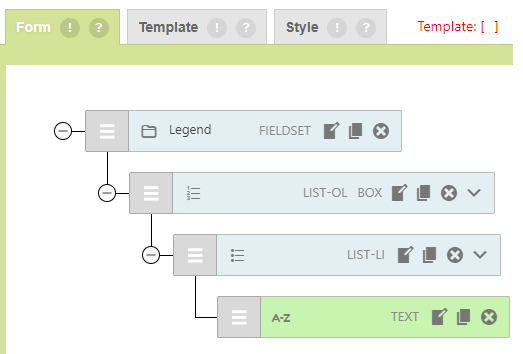 Now, drag and drop the form element you want under the LIST-OL. You can drag and drop elements from the sidebar to the Visual builder. If you do not know how to do this, read our CF7 Skins Visual tutorial. A. Firstly, add the Short Text element. You will see that a LIST-LI element will automatically be created for you when you add any form element under a LIST-OL element. B. Now, click on the edit icon and change its name and label using the Edit element sidebar. C. Now, you can add the other form elements as required under the LIST-OL. 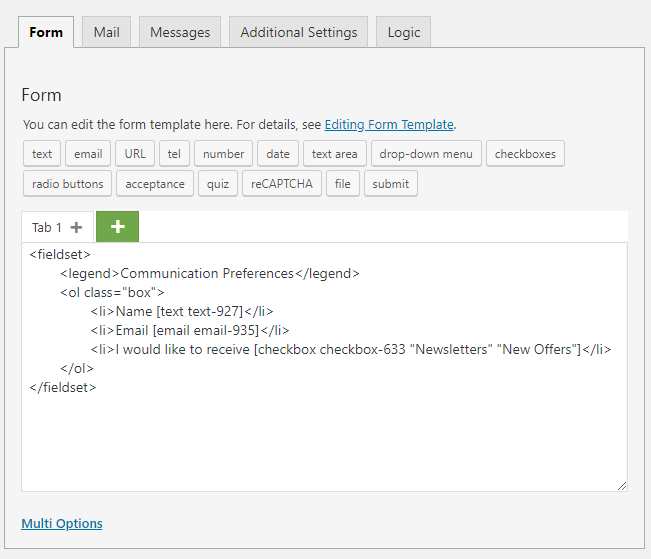 For this example form, we will add two more form elements. 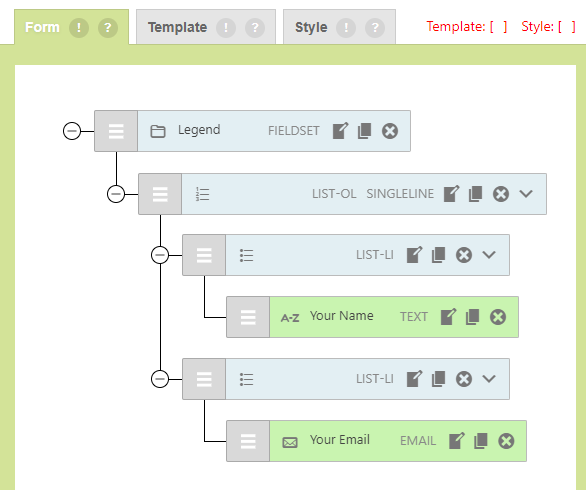 First, add an email field to the form and edit the name and label as above. Note: You can always use our duplicate feature to simply copy your fields, and then change the form element as you need. D. Now, add a checkbox field to the form and edit it as appropriate. Finally, you need to edit the Legend at the top to name the form. The last thing you need to do is to choose a style that you want. If you want more choices in themes, you can get a lot more selections with our Pro Version. You can still use the traditional CF7 form editor to build the form. To do that, you will have to append the CF7 Skins Ready class name “box” to the surrounding LIST-OL tag. 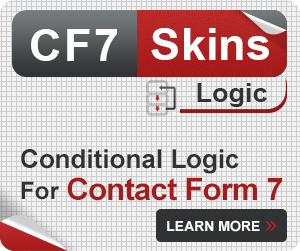 CF7 Skins uses Fieldset, Legend & Lists as the foundation of all CF7 Skins forms. It’s a really good idea to use tabs to keep all your fields indented to show how they are grouped.